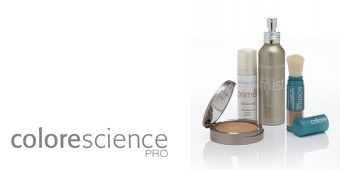 Our range of exclusive luxury skincare products and pro-mineral cosmetics. Epionce is formulated with potent botanical ingredients in proven concentrations using a highly effective delivery system without causing irritation. Paraben and fragrance free, Epionce is suitable for even the most sensitive of skin types. The effectiveness of Epionce has been proven in double-blind clinical trials conducted by independent, nationally recognised research organisations. 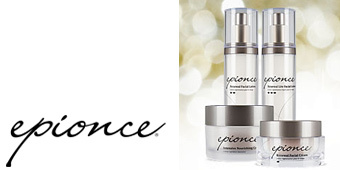 Epionce is a comprehensive and innovative skin wellness line designed to optimise the appearance and health of the skin by working at the core of the skin's own protective and reparative systems, combining a unique sub-layer delivery system and patent-pending botanical formulations. Epionce Cleanse & Prepare - Removes skin impurities without disrupting the intercellular lipids and cells that form the natural protective barrier. Epionce Renew & Fortify - Deeply penetrates the skin barrier to reach targeted cells to strengthen, repair and fortify the skin. Epionce Correct & Boost - Reduces imperfections, smooth uneven texture, and minimize signs of skin ageing such as fine lines and wrinkles. Epionce Protect & Prevent - Prevents premature skin ageing and help reduce the risk of skin cancer associated with outside exposure. Colorescience is a luxury aesthetic makeup line, differentiating products from other makeup lines through high quality, efficacious ingredients, luxury colours and formulations, and convenience and simplicity of use. ‘Our makeup has to be good for your skin, good for the world, and it must make you look and feel beautiful’. Colorescience achieves this by using natural, mineral based ingredients which are competely free of talcs, dyes, fillers, mineral oil, perfumes and other ingredients found in traditional lines, Colorescience gives you beautiful results without disrupting healthy skin function. The most advanced skincare in the World. 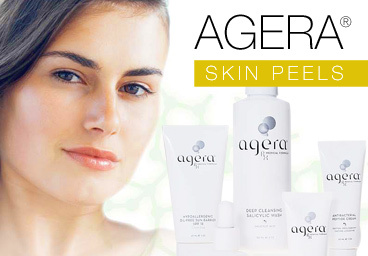 AGERA® peels represent a major advance in the non-invasive treatment of ageing skin, acne and unwanted pigmentation. Laser treatment and laser hair removal for men, including laser facial/skin rejuvenation and laser treatment of sun damaged skin and age spots.